in relazione design ed educazione. MarameoLab sviluppa idee, workshop, libri, giochi o prodotti a scopo educativo per il mondo dell'infanzia, cercando di trasformare l'apprendimento in un momento magico e coinvolgente dove il bambino diventa il vero protagonista. The collective MarameoLab consists of Alice Dellantonio, Manuela Dasser and Maddalena Aliprandi, three young designers born and raised Trentino - Alto Adige. Their collaboration started after their graduation at the Faculty of Design and Art - Free University of Bolzano, where their passion for educational design was born. 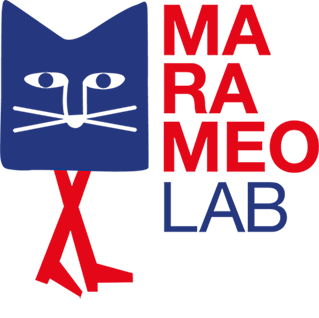 MarameoLab develops ideas, workshops, books and products for educational purposes, dedicated to the the world of children. It aims to transform education into a moment that the child experiences as a protagonist in a magical world. Are you curious? Looking for a partnership? Or simply want to get to know us?